Oliver Wyman's voice sounds like a chainsaw in a minor key in his latest turn as Serge A. Storms in Dorsey's eleventh Florida adventure. The lovable psychopath/hero, Serge, along with his trusty amigo, Coleman, who's always high, cruises tourist sites like the West Tavern, where Lynyrd Skynyrd was inspiration for the song "Three Steps." They're gathering material for a travel website to the weird. The villain, a small-time thug nicknamed "Jellyfish," and a gorgeous stripper who is dancing her way through college feature in a surreal plot. Wyman's mishmash of gravelly accents and Dorsey's off-the-wall jokes make listening to this audio highly entertaining. Serge has returned! That loveable collector of trivia, souvenirs, and murder methods is back with a new A-Tour of Florida. And this time he's out to set the record straight! Serge is upset that his beloved state isn't getting its proper recognition, so he sets up his own wildcat Internet travel-service site, hyper-blogging his way down the coast with his perpetually hammered sidekick, Coleman. Unfortunately Serge's Web presence catches the attention of his nemesis, Agent Mahoney, and the chase is on. Meanwhile, professional robbery crews have begun targeting trade show exhibitors, who may or may not be what they seem. Bodies begin piling up, and Serge has had enough! He's forced into the only logical course of action: shopping at the Home Depot. And this only raises more questions: Who is tutoring strippers through the community college? Where did all these diamonds come from? And does Lynyrd Skynyrd hold the key to everything? It's time to sign on with Serge and see where the twisting, sun-splashed trail leads in Nuclear Jellyfish! Not for everybody. I think Dorsey is a riot. As a mental health clinician, I see "Serge" walk into my office several times a day. Unfortunately, the real life characters aren't nearly as entertaining. SO maybe for me, Dorsey is therapy. This was my first Tim Dorsey novel. I wasn't so sure about the book in the beginning; the plot seemed a bit scattered, and I almost stopped listening. But I stuck with it, and I'm glad I did! The seemingly incongruent plot lines all come together beautifully in the end. A good listen for those who like off-beat humor. I've been listening since Book 1 of the Serge Storms series came out on audio. This performance was great! Major chapter sections are segued with music which enhanced the mood. It's been hard to adjust since the narrator changed, but this performance turned the page for me. Despite what others have said, I started listening to the later Serge books so for me George Wilson is not the 'real' Serge. I think Oliver Wyman does an excellent job. His combination of indifferent narration coupled with spot on character voices is simply perfect. His delivery makes Tim Dorsey's books even funnier and incredibly easy to listen to. At times you think there are multiple narrators he switches between character voices so well. Although I enjoyed the book, I certainly missed hearing the best narrator for Serge & Coleman - Geroge Wilson.. no one can do Serge as good as this man! If you are a fan of Dorsey, you will not be disappointed.. but please bring back Geroge Wilson!!! Can't get enough of Serge! 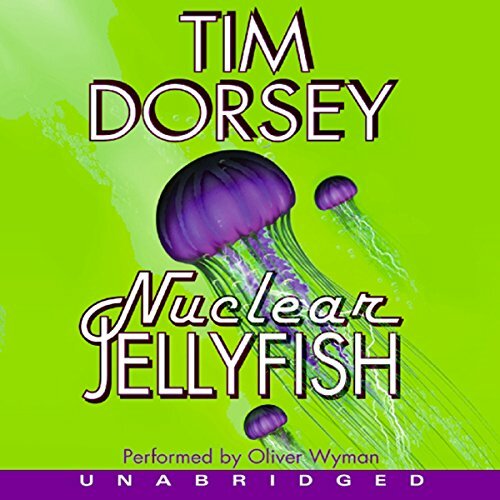 Would you consider the audio edition of Nuclear Jellyfish to be better than the print version? Don't know, because I have not read the print verison. But I have to tell you, listening to this is a riot! Real "laugh out loud" stuff! What other book might you compare Nuclear Jellyfish to and why? Well, the other books in this series. Serge, & Coleman, too funny for words. Wish I could have. And may listen to it again, just for that reason! More Serge, give me more Serge! Did Nuclear Jellyfish inspire you to do anything? Did I mention the narrator sucked. One of his best, if not the best. I simply can not get enough of Serge and Coleman. This is easily one of the very best of Serge's adventures. Great storyline, great narrator, and a twist at the end. I can only hope that more if not all of Tim's books become audio offerings. What a completely and utterly stupid story. THe story line was completely confusing and unbelievable and the narrators voice irritating beyond belief. I couldn't finish it and I rarely leave one unheard. 10 sur 19 personne(s) ont trouvé cet avis utile. I would certainly recommend this book to anyone that likes laugh, follow outlandish plots, and some how find that it is all tied together with a nice little bow in the end. Serge and Coleman are characters that you can't but love and come back to the next book for more. They are so completely different from each other, yet Tim Dorsey found a way to make these two inseparable (well okay he separated them for a short while in the beginning of the series but brought the true dynamic duo back together for a barrel of laughs seasoned with just the right amount of revenge to please your pallet and make you hungry for more. Serge and Coleman of course. Oliver Wyman's impression of the two characters is spot on for their antics.